Just in time for April 22, Kruger Products, maker of Cashmere and Purex Bathroom Tissue, SpongeTowels and Scotties, is launching its first complete EnviroCare family of 100% recycled, made-in-Canada, premium-quality paper products for the home. The new EnviroCare family, unlike other recycled paper products, presents a competitively-priced, premium-quality option that involves no compromise on softness or durability for the consumer and for the environment. A difference you'll feel, the EnviroCare family of products meets EcoLogo's stringent standards for environmental leadership and bears the EcoLogo symbol for easy identification as a sustainable choice. This is good news for Canadians who, according to a recent TerraChoice Survey*, say performance and price are key when switching to a sustainable product. The survey also reports that 88 per cent of Canadians use a third-party endorsement to validate their green purchasing decisions. "Kruger Products is a proudly Canadian company that's committed to good corporate citizenship and to using our market-leading position to make a difference for our planet," says Steven Sage, Director of Sustainability and Innovation, Kruger Products, Canada's leading tissue manufacturer. "Our paper products are best-sellers and the sheer volume we produce creates a huge opportunity to minimize environmental impact," adds Mr. Sage. "We created the EnviroCare family of products to overcome public skepticism and misconceptions based on the poor quality of recycled paper products produced to date. Our goal was to make green paper purchases as easy as possible for all Canadians," says Nancy Marcus, Vice President, Consumer Marketing, Kruger Products. "Our EnviroCare family of products delivers on this goal with unrivaled softness, quality and durability." For more information about Kruger Products and the EnviroCare line-up visit www.krugerproducts.ca. For more information on EcoLogo and their third-party endorsement process, visit www.environmentalchoice.com. 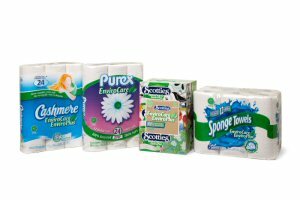 Kruger Products is Canada's leading tissue manufacturer and serves the Canadian consumer market with such well-known brands as Cashmere, Purex, SpongeTowels, Scotties and White Swan, as well as away-from-home products for industrial and commercial use across Canada. Kruger operates facilities in Quebec, Ontario, Alberta, British Columbia, Newfoundland and Labrador, in the United States and the United Kingdom and has 9,000 employees. An electronic HTML version of this release with direct download of a product group shot is available at http://www.strategicobjectives.com/DigitalPressRelease/Envirocare.fxml (http://bit.ly/bUqZiV). EnviroCare, Canada's first complete family of premium quality 100% recycled paper products for the home. Video from Kruger Products recycling and manufacturing facility in Crabtree, Quebec.